The Astuvansalmi rock paintings are located in Ristiina, Mikkeli, Southern Savonia, Finland at the shores of the lake Yövesi, which is a part of the large lake Saimaa. The paintings are 7.7 to 11.8 metres above the water-level of lake Saimaa. The lake level was much higher at the time the rock paintings were made. There are about 70 paintings in the area. 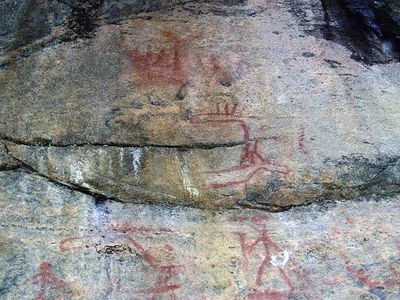 The rock paintings were officially found by the Finnish archaeologist Pekka Sarvas in 1968, though locals knew of them before that.